Alleged state-run mass detention camps for Uighur Muslims in China’s Xinjiang Autonomous Region has recently gained international attention, with numerous critics calling Beijing’s recent efforts a “high-pressure indoctrination program.” While China has denied using detention camps for Chinese Muslims in Xinjiang, on Tuesday, Sept. 10, 2018, the United States Department of State issued a statement declaring that the US government is “deeply troubled” by “credible reports” of Beijing’s mass crackdown on Muslims and the alleged mass detention scheme. While China has long had a tenuous relationship with its Muslim minority concentrated in Xinjiang Autonomous Region — including independence movements and outbreaks of violence — Chinese President Xi Jinping was reported early on in his tenure to be looking to improve relations between Uighurs and Han migrants in the region in order to benefit the government’s new Silk Road Initiative, a project to build a railroad that would connect Asia and Europe. However, recent reports by human rights organizations detail the round-up of Muslim residents of Xinjiang, upon which the arrested — with or without criminal charge — are sent to government facilities in the desert. Detainees are subject to an ideological and cultural indoctrination curriculum, including forced education in Mandarin and singing of hymns praising the Chinese Communist Party. The Chinese government also uses social pressures to forcibly integrate ethnic minorities. Some detainees in the internment camps were allegedly denounced by their relatives for religious activities, such as praying. The government’s encouragement of denunciations and detention of families have caused family separations. Indeed, once inside the internment camps, detainees are pressured not to contact their families. If family members of detainees have fled abroad, detainees are pressured into encouraging them to return to China. Ethnic minorities in Xinjiang region can be punished by the Chinese government for visiting certain countries that are on China’s “26 sensitive countries” list, such as Turkey, Kazakhstan, Malaysia, and Indonesia. 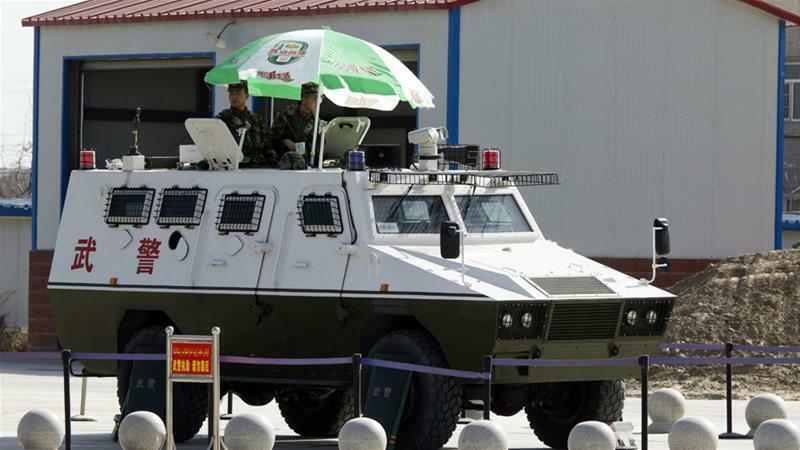 Other than the detention facilities, the Chinese government has also invested its security budget in installing high levels of technology, such as in surveillance cameras inside homes and city checkpoints, to closely monitor all activity in Xinjiang. Xinjiang residents have been arrested for praying, citing passages of the Quran, and fasting during Ramadan. While China faces renewed scrutiny and pressure from international organizations and advocacy groups, foreign states have been notably quiet over the matter. Experts point to China’s global economic influence, which has prevented many countries from publicly criticizing the campaign. The controversial case of a Chinese Uighur woman who was tried in Kazakhstan for illegally crossing the border — with Beijing demanding extradition of the woman back to China — illustrates one of many similar situations faced by China’s western Muslim-majority neighbors. Furthermore, China’s permanent seat on the United Nations Security Council may prevent concrete actions against the country from the international community. Currently, White House is working with bipartisan group of lawmakers in Congress. Republican Senator Marco Rubio, who is also the chairman of the Congressional-Executive Commission on China, commented that his group of Senators are pushing the White House not only to put sanctions on Chinese government officials, but also to ban American companies from selling surveillance technologies to China. US sanctions, if implemented, will fall under the Global Magnitsky Act (2016), a law that allows the US government to impose sanctions on specific foreign officials who violate human rights. Such action would also be one of the first sets of sanctions by implemented by the Trump Administration over a foreign government’s human rights violations.